Whether you’re the kind of coffee lover who makes a stop on your morning commute or you live for the cafe experience, be it a morning jolt or a midday pick-me-up, Fredericton’s got a great locally owned cafe or craft roaster for all personalities and tastes! Urban Almanac General Store | 75 York St. If your coffee is all about the gadgets and you love something a little adventurous you won’t find elsewhere in the city, Tasha’s is the place for you! At Tasha’s, the options are unique and always flavourful. Located in the Urban Almanac General Store, Tasha’s is ramping up the Fredericton craft coffee scene one organic and in-store roasted batch at a time. 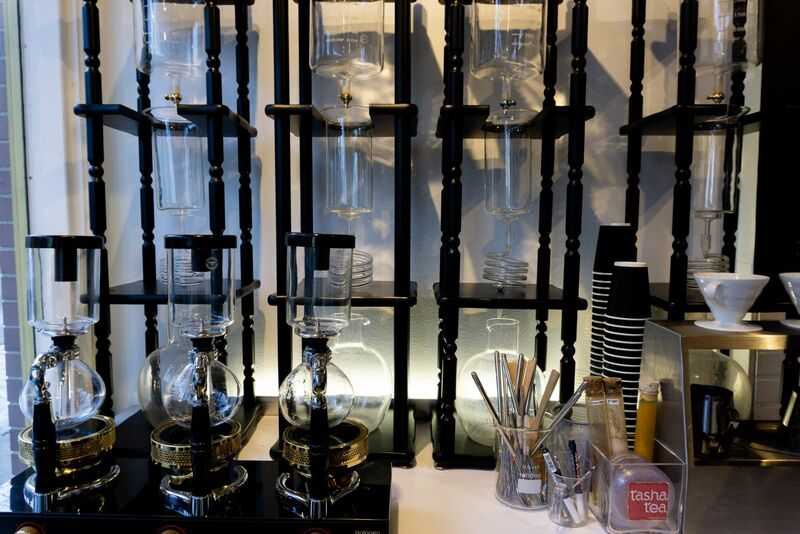 Be it a siphon, nitro brew, or your favourite classics, Tasha’s dark side is sure to captivate your attention with their state-of-the-art equipment and unique choices. Chess Piece Patisserie & Cafe | 361 Queen St.
Cafe Beaverbrook | 703 Queen St.
Arguably the most photographed cafes, coffees and desserts in the city, both Chess Piece locations are the perfect places to hang your coat, sit back and enjoy the atmosphere. With both locations serving organic, fair trade coffee and specialty flavoured drinks, you can indulge in #FancyCoffeeFriday and a Parisian-style dessert! From the classics to the more adventurous and seasonal flavours like gingerbread latte and raspberry truffle mocha, their coffees not only taste great, but they also make the perfect #coffeegram! Heights Cold Brew Coffee Company | 418 York St. If you’re looking for something bold and cold, look no further than Heights Cold Brew! Brand new to the brick and mortar scene, Heights Cold Brew is taking the Fredericton coffee scene to new heights with their bold cold brew and irresistibly smooth nitrogen infused coffee on tap. Their coffees, made from locally roasted beans, are a little stronger than the average making it just the caffeine fix you need to fuel your day. With a second location at the Northside Market, you can also get your Heights Cold Brew products conveniently on the Northside of the city on the weekends as well! Jonnie Java Roasters | 95 York St.
For you, coffee is a global experience and you love to have lots of options from around the world. Wake up your senses as you walk into the aroma-filled store and roastery on York St. and choose from the collection of locally craft roasted flavour profiles spanning 33 countries and varieties! Always freshly roasted, the beans are never more than a couple weeks old. Not sure which country’s beans you’d like to try? Roll the dice and whichever number it adds up to, that’s the bean your coffee will be made from! Whitney Coffee Company - Fredericton Boyce Farmers’ Market | 665 George St.
Join the community in the favourite Saturday morning social gathering spot where you’ll find the local craft coffee roasters: Whitney Coffee Company. Choose from an espresso, latte, cappuccino and drip brewed coffee to start your day. You can even buy a bag of beans to take home with you including fair trade and organic selections from around the world! While you’re there, meet some new friends and do some shopping as you sip your coffee! The Tipsy Muse Cafe | 86 Regent St.
Get creative in Fredericton’s newest cafe! A new collaborative space in the heart of downtown, you can check out their events calendar where you’ll be able to plan attending live music experience in a friendly modern location while remaining close to all of Fredericton’s top attractions! Take a bite out of a world famous St Viateur bagel, snack on delicious vegan treats and don't forget a brew, perhaps best of all, a latte flight! Find a coffee you can’t live without and want to take some home with you? All these businesses sell their own beans which makes the perfect souvenir from Fredericton to enjoy at home! So on the next coffee run, try a new local artisanal cup of joe and it’s sure to be just what you needed on your busy day exploring Fredericton and checking off the list of top must-dos in Fredericton in 2019! Alexis Grant is a "travelgrammer” under the name LifelongExploring, where she can be found behind the lens capturing and sharing her adventures in her hometown of Fredericton and around the world. When not behind the camera, Alexis also enjoys painting, cooking and spending time with friends at UNB where she studies business.